alaTest a collecté et analysé 122 avis de consommateurs et d'experts pour le produit Russell Hobbs 19720. La note moyenne du produit est 3.0 sur 5, tandis que les autres produits de même catégorie ont une note moyenne de 4.2 sur 5. Les auteurs d'avis apprécient le design. La performance impressionne, mais de nombreux avis ont des doutes sur la fiabilité. En moyenne, les consommateurs notent ce produit 61/100 et les experts notent ce produit 60/100. 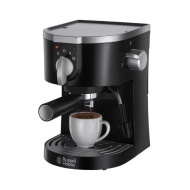 A small, compact espresso machine that doesn't cost the earth, but certainly has worldly limits. It’s cheap, compact and cheerful, but the small size and limited performance come with a few frustrations of their own. Makes good coffee but very disappointed with the actual machine, very flimsy, water very difficult to get into machine, wish I had spent more and got a better machine. "Makes good coffee but very disappointed with the actual machine, very flimsy, water very difficult to get into machine, wish I had spent more and got a better machine." This machine does all I ask of it. Makes a good espresso and Latte. Hope it continues to serve me well in the future. "This machine does all I ask of it. Makes a good espresso and Latte. Hope it continues to serve me well in the future." Does what it says on the box. Water fill is a bit fiddly and noise from machine whilst making coffee/ hot milk is very loud. I used to work in a coffee house, this is louder than a pro machine! Love the coffee it makes for a cheap price. I bought this machine about 2 weeks ago it's working properly and I'm happy to be orgos regular customer. Excellent product for little money. All round great product. A little hard to fill with water.